(Phys.org) —Researchers have discovered an alternative way to make an invisibility cloak that departs from other attempts to do so. Attempts in the past have been via metamaterials, created by assembling structures that interact with the light they will cloak. Metamaterials are far from perfect, are expensive, and are time-consuming, so the research team, from Zhejiang University in China, the Royal Institute	of Technology in Sweden and National University of Singapore, decided to explore other options. They found an approach that looked promising. Lu Lan, Fei Sun, Yichao Liu, C. K. Ong, and Yungui Ma tell the story of their investigation in their paper, "Experimentally Demonstrated An Unidirectional Electromagnetic Cloak Designed By Topology Optimization." They submitted their paper on August 28 to arXiv.org. They searched the literature, looking for reports on sound and feasible approaches for making invisibility cloaks and, among them, they wrote, the most promising one appeared to be "the computer optimization method that relies on numerical simulation and some optimization algorithms to find a best cloaking structure." Computer optimization, they wrote, usually uses "energy functional as a target function and looks for its optimized medium by iteratively modifying the cloaking model, i.e., varying either composition or topology to achieve required gradient index." Topology optimization they wrote, is another option for a suitable cloaking structure. "This method is more promising to yield a practical invisible cloak for a different spectrum, especially for some special cases, e.g., where only certain direction of cloaking is required." The authors reported that they were able to experimentally demonstrate a unidirectional EM (electromagnetic) cloak in microwaves designed by a topology optimization method. In conclusion, they wrote, "We have experimentally demonstrated a unidirectional cloak with a relative large invisible region made of a constant dielectric designed by topology optimization. The fabrication process of a sample is substantially simplified and also efficiently improved." They said only fifteen minutes were needed to fabricate the sample. MIT Technology Review, expanding on the significance of their experimentation, said Tuesday that the team has created the first invisibility cloak designed using topology optimization. "Lu Lan at Zhejiang University in China and a few pals have actually created the first invisibility cloak designed using topology optimization. They carved it out of Teflon and it took them all of 15 minutes using a computer-controlled engraving machine." 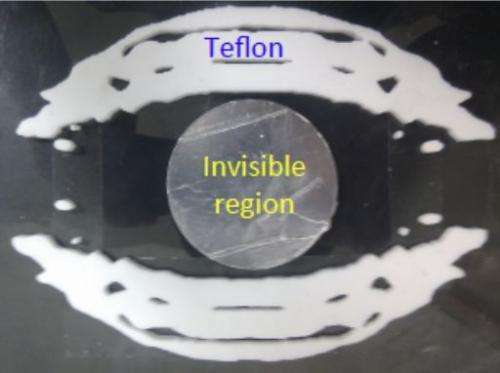 The resulting "Teflon eyelid" invisibility cloak, added MIT Technology Review, hides a cylindrical disc of metal the size of poker chip from microwaves. Its performance closely matches the prediction of the computer simulation. Looking ahead, the team wants to develop the technique to create cloaks that work over a range of frequencies and at a range of angles, according to the review. "If they can make them cheaply and easily for a cost measured in pennies, there's no reason why invisibility cloaks won't soon be everyday objects." Electromagnetic invisible devices usually designed by transformation optics are rather complicated in material parameters and not suitable for general applications. Recently a topology optimized cloak based on level-set method was proposed to realize nearly perfect cloaking by Fujii et al [Appl. Phys. Lett. 102, 251106 (2013)]. In this work we experimentally implemented this idea and fabricated a unidirectional cloak with a relative large invisible region made of single dielectric material. Good cloaking performance was verified through measurement which consists very well with numerical simulation. The advantages and disadvantages of this optimization method are also discussed. Dang- this is pretty impressive. Clandestine orbital stationing comes to mind immediately- and for next to nothing in terms of cost. Satellite cloaking has the potential to become an issue in the not-too-distant future, if it isn't already.